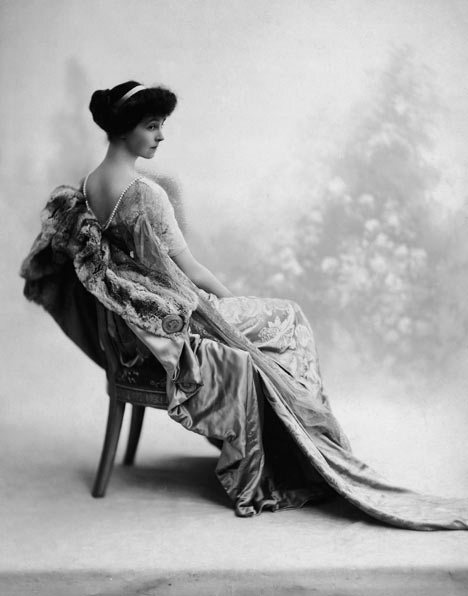 The next Fabergé easter egg in line is the only one commissioned by an American - Consuelo Vanderbilt, Duchess of Marlborough, niece to Biltmore Estate's creator George Washington Vanderbilt. The egg she ordered is called the "Duchess of Marlborough Egg", or "Pink Serpent egg", and it was created in 1902! This egg is enameled translucent rose pink over a gold guilloché ground, and decorated with multi colored gold ornaments. 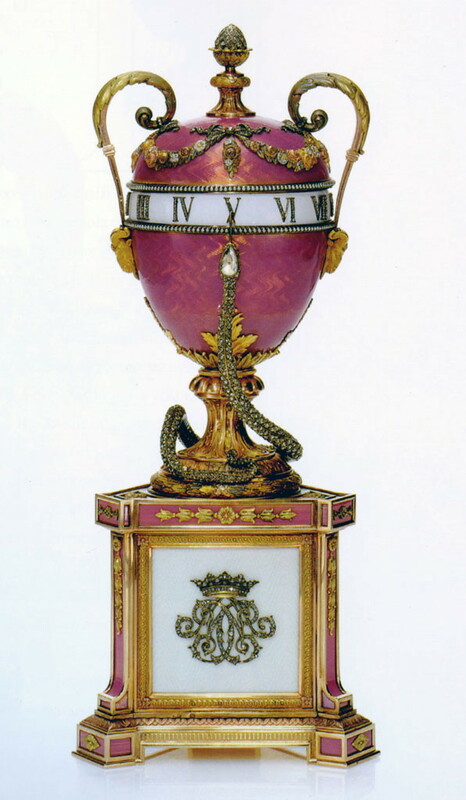 As you can see this is one of Fabergé's clock eggs. The dial, which surrounds the whole egg is white enameled, with diamond-set Roman numerals. A diamond encrusted snake winds up from the gold pedestal, with it's arrow-tounge indicating the time. The triangular pedestal is enameled oyster. One of it's sides is decorated with the diamond-set monogram of Consuelo. The other two sides are applied with a varicolored gold cornucopia, and a gold trophy. In 1902 Duchess Consuelo (pictured above) travelled to russia with her husband to attend the Bal des Palmiers, where she was the dinner companion of Tsar Nicholas II. "With the entrance of the Imperial Family to the inspiring air of the Russian anthem - the procession of grand dukes in splendid uniforms, the grand duchess, lovely and bejeweled, the beautiful remote Tsarina and the Tsar - the ball took on the aspect of a fairy tale", she wrote of the occasion. She also remembered to have dined on "gold and silver plate fashioned by Germain, chased and beautiful in shape and color". During this visit she also visited the Dowager Empress at Anchikov Palace, and most probably saw the Emperess' collection of Fabergé eggs - including the "Blue Serpent Clock Egg", from which she probably got the idea for the egg she ordered from Fabergé herself. After her divorce from Marlborough, Consuelo donated her egg to a charity auction in 1926. The buyer was Polish soprano Ganna Walska. Today the "Duchess of Marlborough Egg" belongs in the collection of Viktor Vekselberg. I love the story behind this and how it links in with the wonderfully interesting Marlborough family, love these photos Miss Meadows, what an awesome egg!